Welcome to Accurate Cutting System Pvt. 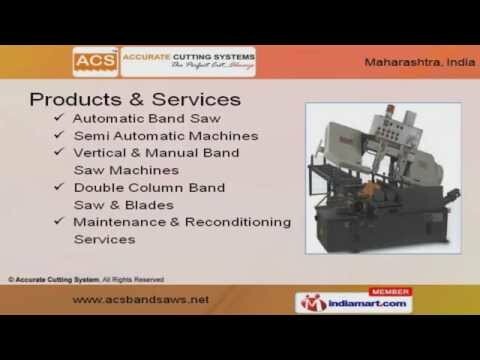 Ltd Manufacturer & Service Provider of Bandsaw MachinesThe company was established in 2006 at Pune. We are associated with Aquatec & SK Steel & cater toTata, Volkswagen & Suzuki. Total customer satisfaction, High tensile strength, Easy payment modes & Excellent after sale service aresome of the key features of our organization. Automatic Band Saw, Semi Automatic Machines, Vertical & Manual Band Saw are some of our products& services. We offer premium grade Automatic Band Saw at competitive prices. Our Semi Automatic Band Saws are a class apart. Along with that we provide Vertical & Manual Band Saw Machines. Double Column Band Saw & Blades are some of our best selling products. We are specialized in offering Maintenance & Reconditioning Services.